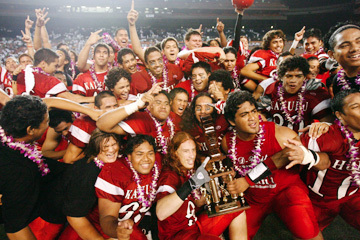 Kahuku players celebrated after defeating Punahou for the Division I state football championship on Friday night at Aloha Stadium. MALOSI Te'o earned the spotlight, but it was truly a team effort that brought another state football title to Kahuku on Friday night. Te'o rushed for 262 yards, including a pivotal 79-yard touchdown, on 30 tough carries against Punahou's rugged defense. But even Te'o's touchdown wasn't enough in itself. Down 21-20 with 6 minutes left, Kahuku faced fourth and 17 at the Punahou 46-yard line. The Red Raiders chose to punt, allowing Gary Nagy an opportunity to deliver. The junior sent a punt right down the hash marks, where it softly bounced inside the 5. Gunner Jede Malufau then leaped for the ball as it bounced toward the goal line. The hustling 5-foot-9, 144-pound sophomore kept the ball alive, and a Punahou returner fell on the ball -- dangerously so -- on the 2-yard line. Three plays later, Kaniela Tuipulotu tackled Punahou running back Kainoa Carlson in the end zone for a safety. That gave Kahuku its first lead, 22-21, with 5:02 left. In a season in which special teams haven't been a cornerstone for Kahuku -- to no surprise -- the play by Nagy and Malufau couldn't have come at a better time. Old school rules: Punahou found more success this season, winning its first Interscholastic League of Honolulu crown since 1977 by mixing its potent passing attack with a commitment to the running game. Case in point: In last week's 30-7 semifinal win over Baldwin, the Buffanblu threw the ball 25 times, but amassed 35 rushing attempts. Against Kahuku, the Buffanblu were decidedly one-dimensional. They ran only 16 times for 19 yards. Punahou's "Pound the Rock" philosophy worked against many defenses, but running between the tackles against the state's top unit was ineffective. Punahou stuck with its aerial attack. Quarterback Brett Kan had 52 pass attempts, completing 22 for 271 yards. While Kahuku did not sack Kan once, they forced him into three interceptions and recovered two Punahou fumbles. What may have hurt the Buffanblu even more was their inability to grind out the clock, as they have done all season, while protecting a lead. Incompletions gave Kahuku lots of time to rally. Kahuku's offense, meanwhile, was almost painfully one-dimensional by running on its first eight plays from scrimmage. That set the tone for a game plan that was locked in gear from start to finish. Whether it was from a Power I, a double-tight end I, or an I slot, the Red Raiders were predictable, but more importantly, safe. The safe, old-school methodology worked. Kahuku's offense did not have a single turnover. By game's end, they had 272 rushing yards on 41 attempts, and Kaulin Krebs completed five of his nine pass attempts for 138 yards. Perhaps more impressive? The Red Raiders committed only eight penalties for 74 yards. Those numbers were a far cry from the 18 yellow flags (160 yards) in a semifinal win over Waianae. "We played with heart," senior center Latu Tupou said. "We practiced hard all week. We all stuck together." Just like practice: Chico Ramirez and his fellow defensive backs did what they could at practice, preparing for Punahou's run-and-shoot attack. With backup quarterback Jacob Kahawaii, a strong-armed 6-foot-4 senior, serving as the pseudo Brett Kan, Kahuku's secondary had plenty of reps facing shotgun trip sets. "From practice, going over the plays, the recognition, our defense did good tonight," said Ramirez, who grabbed two interceptions. No comparisons, please: For Kahuku coach Siuaki Livai, the fourth state football championship in six years stands alone. In fact, each of the four crowns has its own identity. "The first was special, but this is really sweet," said Livai, an algebra teacher. "Give a lot of credit to (Punahou). They were under pressure from our defense and made big plays. All of this is just as much for them as for us." Unified in white: The Punahou side of Aloha Stadium was a sea of white T-shirts. From the bottom of the orange bleachers up to the top of the blue section, Buffanblu fans showed up en masse. That helped bring attendance to well over 24,000, the second-largest in tournament history. The support that came from Punahou's campus all the way to old-time alumni did not go unnoticed by the Buffanblu players. That explained, in part, why so many of them were distraught after the game, unable to stop the tears from flowing. Sam Higgins, who overcame a midseason injury to return as one of the defense's leaders, played through injury again against Kahuku. "I'm exhausted," he whispered. "We were right on the game plan." Defensive tackle Jonathan Overton did his share, as well, chasing down the speedy Te'o twice. "I think we played really well. They had a couple of big runs, and we missed some assignments and tackles," the 6-3, 245-pound senior said. "I'm glad we got this far. This was the funnest game of my life." They don't have a drill for this: Devin Unga, a basketball standout, gets only a few touches each week when he suits up on game day for the football team. The Red Raiders tight end made the most of his chances on Friday, taking a short pass from Krebs to the house for a crucial second-quarter touchdown. The 72-yard catch and run brought his team within 14-12 late in the first half, but Unga's decision to do a flip as he reached the goal line marred what should have been a normal 2-point conversion to follow. By doing his lively flip, Unga was whistled for unsportsmanlike conduct. That set Kahuku back 15 yards on the PAT try, which came up short on Krebs' option keeper. Unga wasn't the only player in the state this year to showboat at the end of a spectacular play. His timing, however, could not have been more mind-boggling. He can thank his defensive teammates for making huge stops in the second half to turn the tide. Innovative or borrowed: Wherever the idea sprouted from, Iolani's coaching staff deserves kudos for adding a new wrinkle in the final week of the season. By adding a "fly sweep" to the offense, Iolani's running game got a boost in Friday's 34-20 Division II state title win over Radford. The fly, a wide receiver in motion, would either receive a hand-off from quarterback Kiran Kepo'o or simply serve as a decoy as the ball was given to running back Mike Hirokawa. On top of all the other possibilities Iolani offers out of the shotgun, the fly element was an excellent device. Hirokawa wound up with 217 rushing yards (23 carries) and 52 receiving yards (two receptions). The ability to stretch a defense vertically is one thing, but forcing defenders to go horizontal opens the field up even more. So much for the common adage of coaches who refuse to tinker late in the season. Warriors helping out: Former UH defensive back Nate Jackson spent much of the season helping the Punahou secondary become one of the best in the state. Another helpful Warrior was Leonard Peters. Since suffering a knee injury early in the season, the safety made a number of trips back to his alma mater, Kahuku, to help at practice. Though both are still relatively young, don't be surprised if and when they face each other some day as opposing head coaches. They aren't the only Warriors showing up on the football field. Recent Aiea graduate C.J. Tausaga, a freshman with UH, helped out at his alma mater this season, as well.